A small particle, but able to give rise to all forms of light: the photon is the smallest and brightest fragment of the universe, of microscopic dimensions but of enormous and multiform creative power. 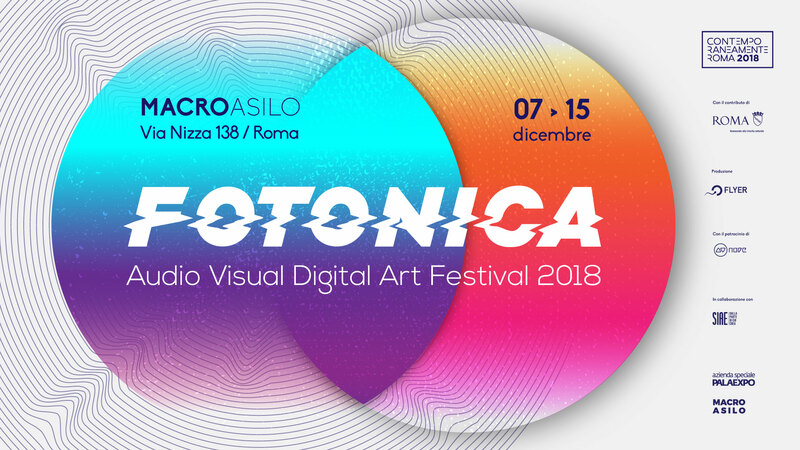 And it is precisely from this concept that the second edition of FOTONICA is evolving, from 7 to 15 December 2018 at the MACRO Museum of Contemporary Art in Rome. FOTONICA is a free festival that wants to explore the art forms related to the light element in the contemporary context. To consolidate the practice of networking and make system in the field of artistic investigation among the most important of the contemporary, the festival is produced in collaboration with national and international partners. The initiative is part of the program of Contemporaneamente Roma 2017 promoted by Roma Capitale, Assessorato alla Crescita Culturale e Sovrindenza Capitolina ai Beni Culturali and in collaboration with Siae. A unique festival in the capitol panorama that boasts a rich program: 27 artists give shape to the most diverse facets of Visual Digital Arts and make them accessible to an ever-wider public. The heart of the project is the audio video performance in collaboration with Live Cinema Festival and Zsolnay Light Festival and the Audio Video Installations with Athens Digital Art Festival, Patchlab, Video Mapping Mexico and Errore digitale. On the front of NetArt, organized in collaboration with Shockart.net, it is possible to interactively visit the Net Paintings web art exhibition organized by Shockart.net in 2005. Inside FOTONICA there are also the DJ sets of electronic music of the Manifesto delle Visioni Parallele side by side in the video part by VJ Set curated by LPM Live Performers Meeting. FOTONICA has then devised a large space dedicated to the theoretical and practical approach of the world of audio-video and digital art thanks to the lectures, workshops on themes and instruments concern the digital and visual arts with Fusolab 2.0 and the children’s laboratories of theAthens Digital Art Festival and KidsBit, which aim to bring the youngest into digital culture through creative tools and stimuli. PHOTONICA is produced by Flyer, which in 2004 brings together LPM Live Performers Meeting, the largest event in the Audio Visual Arts industry.